Taylor Guitars debut new small body 12-string guitars, florentine cutaway grand symphony models and a tobacco burst top option for 800 and 900 series. Today Taylor Guitars® announces the expansion of its popular and innovative small-body 12-string design platform with the launch of the new Grand Concert 362ce. The company is also making its Florentine cutaway a standard feature on all Grand Symphony cutaway models in its 500 Series and up, and is introducing a tobacco sunburst top option for its rosewood/spruce 800 and 900 Series. The 362ce’s compact cutaway Grand Concert shape features solid Tasmanian blackwood back and sides and a mahogany top. What has made Taylor’s breakthrough 12-string design especially appealing is its physical accessibility—the lap-friendly Grand Concert is a pleasant departure from the traditionally beefier size of bigger-bodied 12-strings, making it easier for players to set the strings in motion. The combination of the 12-fret neck and the 24-7/8-inch scale length also gives players a comfortable handfeel that makes fretting easier and once again underscores Taylor’s reputation for making ultra-playable instruments. 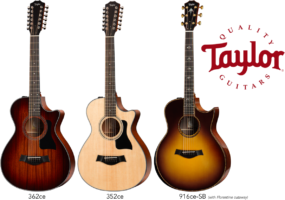 The 362ce and 352ce will both be available at retail in August 2017 for $2,099 and $1,999 respectively and will ship in a Taylor deluxe hardshell case. For additional information, please visit us at www.taylorguitars.com.The post Summer NAMM 2017: Taylor debut small body 12-strings and more appeared first on The Guitar Magazine.